Efe Gürkan GSOC | My GSOC adventures. First of all thanks all of the guys for the great conference. It was a great experience for me as always. So I am making another blog post which is more like a travel post, so it will be on my main blog instead of this. So I will summarize shortly what I learned. About project itself. – LibreOffice code itself is big, but the people who working on it is not that much. Yes, yes I know there are 2-3 person projects which are awesome. Yes I know we are huge if you compare us with them. But we are not “THAT” big. -LibreOffice development speed is fast. I mean fast as the car which overtakes you in autobahn when you were going 180kph, and you couldn’t see the color of the car. -We have much more better OOXML support compared to last year. I mean much much much more better. -Watching Fridrich presenting is the best thing I have done in my entire life! -Did I mentioned Unit tests are important? If I didn’t, Unit tests are important! -We have OpenGL on charts and Impress ! How cool is that! Here are some pictures I took with my cellphone. So they are potato quality photos. If you don’t like your presence on the photos contact me so I can delete it if you want. Bu yazı Genel kategorisine 10 Eylül 2014 tarihinde namcojoulder tarafından gönderildi. After the conference at Milan I wanted to share my experiences. This is about observations and thoughts about conference and some speech people made and some general things about Milan, Italy and Cultural things. It was my first global Free Software/Open Source conference. I joined a few local conferences in Turkey before but this was first in that big scope. I wasn’t expecting learning this much from a conference. It was one of the greatest experiences of mine. I joined both hackatons. Solved a bug with Siqi and Florian, get some pointers to implement Expert Config page a search bar from Kendy and about Collaborative editing from Michael. The most important thing is I feel more self-esteemed and more ambitious about being a LO hacker 🙂 . Disclaimer: Completely personal ideas! It means may contain some unrelated and/or wrong parts. Feel free to comment or Ignore. I have some thoughts about CloudOn and their focus on OOXML. They are focusing on OOXML and interoperability with MS Office because and this is a great thing. But it is also great for LibreOffice too. Lets have a look how things work in my country. Not speaking about companies, it is my friends and family. People use MS Office mostly(over %95 maybe ?). Most of them are pirating it, so it is free for them(!). They are completely happy with it and don’t need anything else. It is “the original”. They don’t care the rest. When I tell try LibreOffice and don’t pirate software, they generally try it. But starting to compare it with MS Office immediately. When they encountered a problem, raging immediately and never use it again. Because of the MS Office is “the original” for them, they don’t even try to use ODF. So my way is telling them to use LibreOffice and if you find a problem. Try old MS formats first. The old binary format filters are more mature then OOXML. And this is better way to encourage people to use LibreOffice. They rage less often this way. After some time later using LibreOffice, I start to recommend ODF. So with this way my friends are using LibreOffice for their daily usage. This is great especially for students like me, small companies, teachers etc etc. I think key part of the migration for this kind of people is OOXML interoperability. For bigger companies use Office programs so much story might be different. But it is not enough. LibreOffice has a great community. It is also a growing community. We need great features like remote control apps for smartphones(hold on, we already have this great apps!!! ;)), collaborative editing as well as the interoperability. And some small things that matters too much to the end user. Genel içinde LibreOffice etiketleriyle 28 Ekim 2013 tarihinde namcojoulder tarafından gönderildi. This post is a detailed view of the my first GSOC process. I don’t post entries to the blogs often, so the ones I post are generally long posts. One of the reasons of the opening this blog was to provide information for the new contributors(like me). For better transition to being productive. I did a lot of small mistakes which are blocking the development. I thought telling these mistakes or some challenges to the others should be useful. I will publish them later. So anyway get ready to a long post. I was hoping to get a boost on development and better understanding the LibreOffice Code when I first applied to the GSOC. I wasn’t have a great experience on coding. Most of the work I did before was some School projects. Biggest one was implementing a graph algorithms visualizer with Python. So we can say I am not experienced at all. The page is now handles about 25K lines of options. It shows all of them and edits them back. 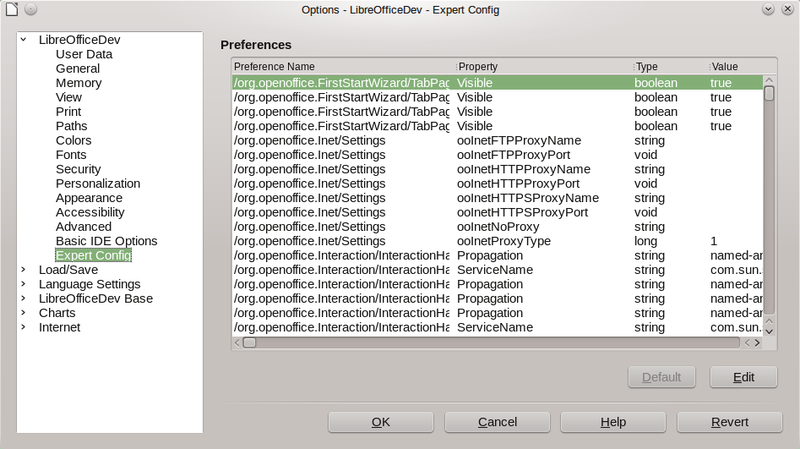 Libreoffice has a about:config utility as expected from the GSOC project. Yes it is working but it is not in enough quality I think. At least not enough for me. I will continue to work especially on this page. Current situation with technical details. Uses “OptHeaderTabListBox” for showing the options. It is basically a “SvSimpleTable”. Edit button opens a new dialog(value dialog) and checks the given string according to the type of the option. If it is correct stores it in a vector for saving it later. boolean types are toggled with edit button no new dialog opens. If you try to enter a string instead of a integer type(short,long,hyper) you simply cannot. It controls the key inputs for integer types. If you write a number which exceeds the range of the number it is controlled for integers. But if you do this for float,double or in a list type the value will be 0. Need some work on there a little more. Page loads about 6 seconds. It was 20 minutes on first working load. Still not perfect but I can definitely say better :). Page don’t have a filterbar yet. Which is important when you talk about 25K lines of options. Page has visual problems. Values are so long, tab page is not enough for that long. Thinking to move it as a Dialog to advanced page. There is a default button which doesn’t work for now. Value dialog has a custom edit widget. I planned to use a custom multi edit but couldn’t make it work. So for the time being I used a custom edit. So yes, It works but also need more work for quality. Which I plan to make the page better in following weeks. Bu yazı Genel kategorisine 18 Eylül 2013 tarihinde namcojoulder tarafından gönderildi. If you are planning to contribute code to the LibreOffice, there are some points you will have to learn. You have to learn use an terminal based editor. You can use everything but vim or emacs are commonly used. Also you should learn using indexers. You have to learn debugging. This is really important. Broken gdb may cause delays from schedule. Trust me. You should be able to read a lot of code and documentation. These are my observations from first weeks. Terminal tabanlı bir metin editörü kullanmayı öğrenmelisiniz. Her şeyi kullanabilirsiniz ama genelde vim ya da emacs kullanılıyor. Ayrıca indexleyicilerin kullanımını da öğrenmelisiniz. Debugger kullanmayı öğrenmelisiniz. En önemli kısım sanırım bu. Bozuk bir debugger (gdb) yaptığınız plandan sapmanıza sebep olabilir. Ayrıca bolca kod , belge okuyabilmelisiniz. Geliştirmenin ilk haftalarından edindiğim gözlemler bunlar. Bu yazı Genel kategorisine 02 Temmuz 2013 tarihinde namcojoulder tarafından gönderildi. After the announcement of the accepted students there is a gap until start of the coding named community bonding period. This is pretty important because you are working full-time with the community and you have to know each other to communicate. I couldn’t hacked around the code after sending proposals because of my final exams. But I am trying really hard to catch up. I am implementing it with C++. It will sit on CUI module. I spend first week mostly to the researching the code. We need an multi-column listbox for this implementation, and I probably use one of the current multi-column listbox as base. I spend some time to understand backend of visual staff (event handlers etc.). If you are a newcomer to the development here is a note “There is a lot of 90’s fashion code on the project. Be prepared.”. And drink mineral water. Really. I was drinking mineral water when I felt moments of enlightenment :). This is probably the longest post for this blog. Next posts probably will be shorter. GSOC’ta kabul edilen öğrencilerin açıklanmasından kodlamanın başlamasına kadar olan Türkçe’ye “Topluluğa Katılma Safhası” olarak çevirebileceğim bir süreç var. Oldukça önemli bir süreç aslında çünkü tam zamanlı çalışman gereken bir projede çalışacağın insanları tanımak zorundasın. Ben bu sürece final sınavlarım sebebiyle son anda katılabildim, haliyle kodlarla da çok ilgilenemedim. Ancak aradaki farkı kapatmak için şu an oldukça çabalıyorum. Bu bağlanma sürecinde mentorumla önce IRC üzerinden sonra Google+ Hangouts üzerinden bazı toplantılar düzenledik. Projenin nasıl gelişeceğini, neler yapmam gerektiğini belirledik. Biriyle tamamen İngilizce konuştuğum ilk seferdi sanırım bu. Unutmadan projem LibreOffice’e Firefox’taki about:config sayfasına benzer bir alan eklemek. CUI(Hemen hemen her modülde kullanılan özellikler var (toolbar, ayarlar gibi)) modülünü bolca kurcaladım. Bir glade dosyası prototipi oluşturdum. İlk haftayı genel olarak kodda araştırmalar yaparak geçirdim. Projem için birden fazla kolunu olan bir listbox yapısına ihtiyacım vardı. Neyse ki kodda taban olarak alabileceğim benzer yapılar var. Arayüzü koda bağlayan araç setiyle alakalı kodları biraz anlamak için biraz zaman harcadım. (Event handlerlar vs, Küçük bir tavsiye daha önceden kendi küçük projelerinizde görsel arayüzü olan bir şey olsun. İşin arkaplanını iyi anlayın.) Eğer yeni geliştirmeye başlayacaksanız küçük bir not. Kodda birsürü benden yaşlı 90ların modası parça var. Hazırlıklı olun. Bu yazı Genel kategorisine 23 Haziran 2013 tarihinde namcojoulder tarafından gönderildi.